United Theological Seminary will host Vision to Victory, an annual celebration honoring the life and ministry of Dr. Martin Luther King Jr.at around the time of his martyrdom. “Vision to Victory is an expression of United’s longstanding commitment to the African American Church and our respect and admiration for Dr. King,” said President Wendy Deichmann. United Theological Seminary hosts Vision to Victory, a tribute to Dr. Martin Luther King, on April 17-18, 2012 in Dayton, OH. 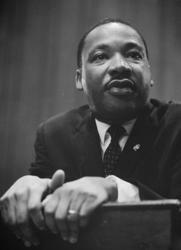 DAYTON, OH _ On April 17 and 18, 2012, United Theological Seminary will host Vision to Victory, an annual celebration honoring the life and ministry of Dr. Martin Luther King Jr.at around the time of his martyrdom. Dr. Margaret Mallory, retired United Methodist pastor and district superintendent, is the featured speaker at 7 p.m. on Tuesday, April 17, at Omega Baptist Church, 1821 Emerson Ave., Dayton, with a reception following. On Wednesday, April 18, Dr. Mallory will preach at United’s chapel service, held at 11:15 a.m. at the campus at 4501 Denlinger Rd., Dayton. Dr. Mallory has served churches in Springfield, Dayton, Lima, and Toledo. In 2001 she was appointed to the office of superintendent in the Toledo area and served there for five years. She has served the West Ohio Conference as Chair of Conference Relations Committee, a member of the Conference Board of Ordained Ministry, and the District Strategy Committee. United, now in its 142nd year, is one of the fastest growing theological schools in the United States. It was founded in 1871 by Milton Wright, a Bishop in The United Brethren Church and father of Wilbur, Orville and Katherine Wright. United offers accredited, innovative graduate and non-degree education programs for both clergy and laity.